When I was growing up I loved the nights my parents would pull out the air popper and we’d make a ginormous bowl of popcorn. I can still hear the whir of the popcorn machine and the sound of the popcorn kernels dropping in. For some reason, it was such a treat to be the one to get to pour them in. My mom had to make my siblings and I take turns for that privilege. Then we’d add melted butter and salt and it would be delicious! We’d each grab a little out of the big bowl to put into our own individual ones and enjoy the freshly popped mixture. I’m being honest with you when I tell you I was in late middle school before I realized that microwave popcorn was a thing! Nowadays I make popcorn both ways, depending on what I’m craving. Today I have a really fun Valentine’s Day Popcorn recipe for you. The great thing is you can use a bag of microwave popcorn OR make your own air-popped kind. This recipe is so yummy and so cute. The white, red, and pink colors just scream Valentine’s Day. It’s so quick and easy to make. And you can even use it with our free “Happy You Popped Into My Life” printable. The beginning of this recipe is very similar to our Pilgrim Popcorn so you may already know how to get started! First, start by popping some popcorn of course! We made roughly 10 cups. We have a cute little air popper that was perfect for the job. But you can definitely use a microwave bag of white popped popcorn as well. Helpful hint: You may want to remove any un-popped popcorn kernels before continuing on with any more ingredients! Second, melt some white chocolate melting chocolate (we used 9 ounces) or white almond bark. Normally I use a double boiler but since the exact consistency wasn’t as important for this recipe I just threw it in the microwave. Helpful hint: Make sure you melt your chocolate in short increments in the microwave. If you overheat it, it will become too hard and won’t go over your popcorn well at all. Third, pour the white chocolate into your popcorn. Next, add in 6 ounces of red M&M’s. You might already be used to separating red M&M’s from the rest if you tried out our Reindeer Games recipes!Then, the best part. Add in some sprinkles. You can use as many or as little as you’d like. You can try out different sizes or sprinkles, maybe you even have some sparkly or heart-shaped ones on hand! Mix gently but thoroughly then lay out the popcorn mixture on a pan lined with parchment paper. Put it in the fridge to set for about 15-20 minutes. When the time is up, remove from the fridge. Break apart to the desired size. Remove any un-popped popcorn kernels. Melt white chocolate melting chocolate or white almond bark. Pour the white chocolate into your popcorn. Add in sprinkles of your desired amount. Lay out the popcorn mixture on a pan lined with parchment paper. Remove from the fridge and break apart to the desired size. 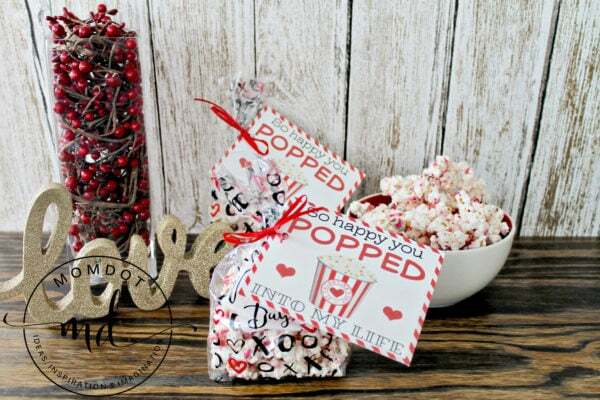 Serve your Valentine’s Day Popcorn in cute bowls, or package in fun cellophane and share with a friend! Let me know in the comments below what your favorite way to have popcorn is! Hmmm. I’ve seen this exact recipe on another baking website YEARS ago. Are you stealing content? That’s the thing about recipes– they are passed along through the years, many times from family member to family member or friend to friend. In this case, I was given the recipe from my daughter’s preschool teacher in 2005, after she made it for a Valentine’s party for the kids. As far as stealing content, these are my own pictures, as well as my own words. Stealing content would be taking pictures and passing them off as my own work, which I would never, ever do.